The Playhouse Theatre is a West End theatre in the City of Westminster, located in Northumberland Avenue, near Trafalgar Square. It was orignally named The Royal Avenue Theatre. The Theatre was built by F. H. Fowler and Hill with a seating capacity of 1,200. It was rebuilt in 1907 and still retains its original substage machinery. Its current seating capacity is 786. 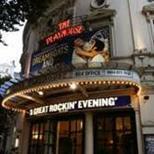 The Royal Avenue Theatre opened on the 11th March 1882 with a revival of Offenbach's Madam Favart. The prefix Royal was soon dropped from the theatre's name, but comic operas, burlesques and the like remained the staple fare for several years. For much of this time, Arthur Roberts, a popular star of the music halls, led the company at the Avenue. In the early 1890s the emphasis changed to drama and in 1894 Miss Horniman, the tea heiress, later a pioneer of the repertory movement, anonymously sponsored the actress Florence Farr in a season of plays. Sadly, the first production failed but Miss Farr persuaded her friend, a certain George Bernard Shaw, to finish his play, Arms and the Man, as a speedy replacement and his first West End production. It was successful enough to allow him to drop his music criticism in favour of play writing. Since then, the beautiful Playhouse has hosted the likes of WS Gilbert, legendary actress-manager Gladys Cooper, the BBC, The Almeida Theatre Company, The Peter Hall Company, and Janet McTeer. In January 2003, Maidstone Productions became the new independent owners of the Theatre. Maidstone Productions, belonging to London and Broadway producers Ted and Norman Tulchin, has been behind a string of hit productions on both sides of the Atlantic, including Gagarin Way, Eden and Vincent in Brixton in the West End; Yazmina Reza's The Unexpected Man, as well as Donald Margulies' Dinner with Friends, which won the Pulitzer Prize. This was in addition to Turgenev's Fortune's Fool on Broadway, starring Alan Bates and Frank Langella, both winning Tony Awards for best actor and best supporting actor. In March 2003, the Ambassador Theatre Group took over the stewardship of the Playhouse Theatre and is responsible for the theatre's management and programming, working with Maidstone Productions and the team at the theatre. Recent productions include Richard Eyre's production Vincent in Brixton starring Clare Higgins and Journey's End directed by David Grindley. The theatre has been home to Dreamboats and Petticoats and The Mystery of Charles Dickens. The closest tube station is Embankment which is approximately 100m away. You can also use Charing Cross. The closest train station is Charing Cross which is approximately 250m away. The venue is in central London so it is advised to use public transport where possible. There is a taxi rank on the Embankment and at Charing Cross Station. The buses you can use are 3, 6, 9, 12, 13, 15, 23, 24, 29, 53, 77A, 88, 91, 139, 159, 176 and 453. There is a MasterPark in Spring Gardens (Trafalgar Square), and a NCP at Bedfordbury. The theatre has access for patrons in wheelchairs. Please contact the box office for more information and to book on 0844 871 7677. The Ambassador Theatre Group is now offering state-of-the-art Sennheiser infra-red listening systems in the venue. Guide dogs are permitted in the auditorium at the end of a row in the stalls. The venue staff are happy to dog sit during a performance. To book or for more information on access, please call 0844 871 7677.